If you have no idea on how to transfer saved or downloaded WhatsApp photos from iPhone (XS/XR/8) to computer, for freeing up space or other reasons, just follow this simple guide. WhatsApp gradually established its dominance in messaging platform, along with gorgeous features of video calling and file sharing including videos and photos. Not long ago, it put up with new "unsend message" feature to help recall sent photos, videos and other messages on both sender and recipient's phones, by directly tapping on "Delete for everyone". As to this post, it will mainly focus on how to transfer WhatsApp photos from iPhone to Windows PC. Kindly remind that the guide and tool shared also work perfectly on transferring WhatsApp videos from iPhone to PC. No matter whether WhatsApp images are saved automatically or manually, after a period of time, piles of WhatsApp photos of various types - funny, cool, cute, romantic, creative, private or so might fill your iPhone up with many other photos. So regularly migrating WhatsApp photos from iPhone to PC is a good way to free up iPhone space, as well as backup photos or protect your privacy. iTunes lays more emphasis on managing and syncing music files on iPhone, but not photos. Besides, iTunes errors on Windows are quite common to encounter with regard to downloading, installing, upgrading or working. So iTunes is not the Mr. Right to transfer WhatsAppp photos to PC from iPhone. 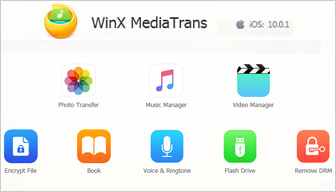 WinX MediaTrans stands out from countless iPhone managers for its high stability, security, flexibility and strong support of new HEICs, ensuring the safety of WhatsApp photos and other content at 100% percent during the transferring process, with no data missing. After file exporting, you can also clear the cache to guard your privacy. - Need to install iTunes or its components like "Apple Application Support" & "Apple Mobile Device Support" on the computer beforehand? Absolutely not. 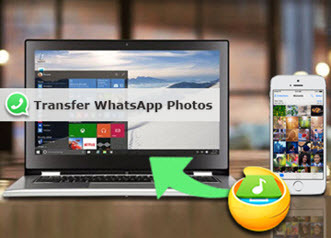 Now, please FREE DOWNLOAD and install WinX MediaTrans on your Windows PC (not on iPhone) and follow the steps below for WhatsApp photos moving. Step 1. 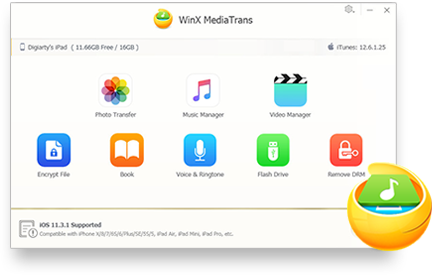 Connect your iPhone to PC via genuine Apple USB cable, and open WinX MediaTrans to have the software access to your iPhone successfully. If this is the first time to plug your iPhone to this computer, please tap "Trust" on "Trust This Computer" dialog box appearing on iPhone. Step 2. 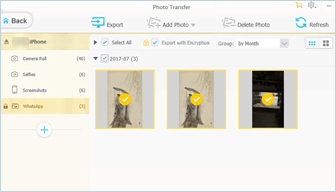 Click "Photo Transfer" item on the main interface to pup up a bigger "Photo Transfer" window. Step 3. Many iPhone photo albums are listed in the left side, including Camera Roll, Selfies, Screenshots, WhatsApp and more. WinX MediaTrans is able to arrange the photos in smaller thumbnail or medium size by day, month or year. Navigate to WhatsApp, select all or partial WhatsAppp photos you plan to copy into computer. Step 4. Click blue "Export" button on the top left to transfer WhatsApp photos from iPhone to PC at fast speed. The default path for exported photo items is: C:\Users\username\Pictures\MediaTrans, which is available to change under Settings. WinX MediaTrans has added data security functionality to encrypt WhatsApp or other photos exported with password. The only thing you need to do is to check "Export with encryption" option before exporting. If you also want to password protect many other photos stored on computer, WinX empowers you to do so with "Encrypt File" feature. The easiest iPhone/iPad manager to manage, back up iOS files. Transfer tons of (HEIC) photos from iPhone XS/XR/8 to PC in a flash. Support encrypting private WhatsApp Photos with password. Transfer/Convert 4K videos, sync music between iPhone and PC. Once the WhatsApp photos are fully sent to computer, you can delete those on iPhone directly by hand. The only issue is that after deleting, they will all appear blurry and cannot be re-downloaded unless the contact transmit them to you again. If you think the post useful, please kindly share it! If you're trying to transfer WhatsApp videos from iPhone to computer (PC) for a backup, 3 ways introduced here are definitely helpful. Obviously, Whatsapp supports sharing video online. But Whatsapp video converter is needed to convert videos to file formats supported by Whatsapp for sending and sharing with family and friends.